Presentation and paper by Mrs. Joke Muylwijk, Executive Director of the Gender and Water Alliance at the 3rd Arab Water Regional Conference. 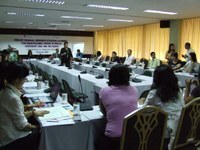 Gender Mainstreaming in IWRM. Efficiency and sustainability. Gender Mainstreaming in Integrated Water Resource Management. Gender, efficiency and sustainability. Paper prepared for the gender session at the 3rd Arab Water Regional Conference.